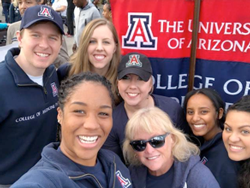 Diversity is one of the core values of the University of Arizona College of Medicine – Phoenix. I felt tremendous pride seeing our students and faculty participate in the annual MLK march in January (pictured right), honoring the principles that Dr. King so eloquently professed. Our Office of Diversity and Inclusion will officially launch a five-year strategic plan this year. I can think of no better time to emphasize that the College of Medicine – Phoenix fosters a culture of inclusive excellence, which means we harness the differences, talents and unique qualities of all individuals at the individual and system level. Such a culture creates role models, broadens perspectives, combats negative stereotyping and allows us to provide world-class health care for all. Achieving inclusive excellence will depend on how well our campus community values and engages the diversity of students, staff, faculty, administrators, alumni and community constituents. Such a comprehensive effort means no less than a cultural transformation where inclusive excellence becomes part of every endeavor and every level at our college. Our faculty, students and staff come from varying backgrounds, experiences and areas of expertise. We are Native American, LGBTQ+, Asian American, White, Latino, African American, women, men, veterans, people with disabilities, Jewish, Christian, Muslim and represent many other communities and identities. This rich diversity allows us to develop innovative solutions to complex scientific questions and helps us train culturally sensitive clinicians and scientists. We are excited to embrace this mission and will continue to champion diversity and celebrate the differences that make each of us unique.